Kids, well girls, usually love fairies. It's a classic part of childhood for them. So fairies are a bedroom decor theme that's popular and loved. Throw pillows make a room soft and comfy. 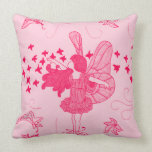 Fairy throw pillows make a nice addition to a fairy themed bedroom because they give some extra color and brightness. They're an easy way to create a themed room too if you don't want to spend too much money. Now the only issue you might have adding some fairy throw pillows to your daughter's room is finding some good ones. They can be hard to find but I have been able to track down some that aren't too grown up for a child's room. These Fall Fairy throw pillows caught my eye for a few reasons. Firstly this fairy pillow comes in a few different colors. There's the pinky-purple one that I've shown here, but there's also blue, purple, green, red and fall colors. This makes it easier to match the color scheme in your daughter's room. I also like the sweet, child-like look of the artwork used on this pillow. This is an original, hand drawn design and it makes it a nice choice for a child. This fairy throw pillow has a cute design with 5 cartoon fairies in a fairy garden. 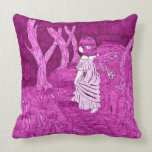 They're surrounded by flowers and mushrooms which gives this pillow a fairy tale feel. Each of the fairies are doing something different. This means it's a great imaginative pillow that lets children create little stories for each fairy. The varied colors used in this pillow mean it will go also with most decor colors really well. So if you need something to balance out your child's color scheme a bit with some added color that won't clash with what's already there - this would be a good choice. This Fairy Tale World pillow is more child-like than the Fall Fairy pillow. This means your child might grow out of it faster than the Fall Fairy option. But it's very easy to hand down pillows to younger siblings. You might even be able to sell it on Ebay. This makes it less of a problem if this Fairy Tale World pillow becomes "uncool" as your daughter gets older. This is one of my favorite throw pillows for a girl's room. It has a gorgeous design with a little mouse watching over a sleepy fairy. It's just like a miniature children's story because it tells a tale with great beauty. I also like the colors of this pillow. Peaceful colors of mostly green and blue. This color choice makes it a relaxing pillow to have in a bedroom. So if these colors go with your decor it's a really nice choice for a girl's room. If you're wanting something that's mostly blue this fairy pillow is the nicest blue one I could find that would be good for a girl's room. The stripes in different shades of blue are bright and eye-catching. The fairy in the contrasting yellow adds extra color for a bright throw pillow. The fairy herself is a cute little cartoon character with big eyes. She's not quite as child-ish as the Fairy Tale World pillow design. So she, like the Fall Fairy pillow, should be good for older girls too. This is a fun fairy throw pillow for kids. She just brims over with happiness and good-natured mischief. The artwork is in a cartoon style of course but this fairy has a very individual look to her. She's not just another fairy cartoon character. The use of a white background in the design also means this pillow isn't overwhelming. The fairy isn't specific to any single color either, although pinks and purples are featured. This makes this pillow a very flexible choice if you need something that will blend in without overwhelming your child's decor. 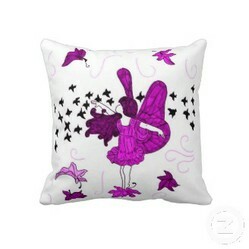 If you need something bright and bold this Fairy on Mushroom pillow is a nice choice. This fairy is another sweet cartoon character with fair hair and green clothing and wings. Her light coloring is nicely contrasted with the bold navy background and red mushroom. Now this design could have become dark looking if the designer wasn't careful. But the creator has added some light sparkles to the artwork. These lighten up the whole design because they almost glow on the darker background. So this design certainly makes it into the best fairy throw pillows for kids rooms list. Great ideas for creating a fairy themed kids bedroom. Do you know what the best fairy jewelry choices are for kids? Here's some of the best. A Fairy iPhone 5 Case is an easy way to create a little magic on your phone. Cute pillows! I like Fairy on Mushroom and Sweet Dreams the best.